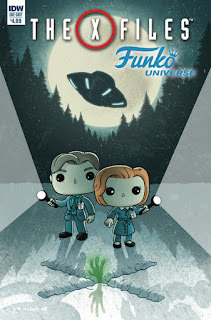 The Fellowship was fortunate enough to obtain a copy of THE X-FILES FUNKO UNIVERSE ONE-SHOT from IDW Publishing. Derek Fridolfs, Pamela Lovas, Neil Uyetake, Mike Raicht, Charles Paul Wilson III, Ryan Hill, Matthew Dow Smith, Chris Fenoglio, Denton J. Tipton, and Troy Little are the creators. Stories in this one-shot include: Scully drives Mulder a little crazy with her unflagging skepticism. Junk food addiction causes some harsh consequences X-Files style. Mulder visits Area 51 and has the encounter of a lifetime. And a Sasquatch spotting trip gets weird. There are two cool things about this book. First, these stories all bring a humor that’s more than a little self-mocking, which I find refreshing in as serious a property as X-Files. And second, all of the characters are drawn to look like Funko figures, which is more cute than I expected. The writing works well overall, and the art does more than just cute-ify – there are also some dark moments here. This is a strong addition to any X-Files fan’s comics collection, and could also be great as an intro to a new, younger audience. Definitely pick this one up. THE X-FILES FUNKO UNIVERSE ONE-SHOT is available now from your local comic shop, or online at idwpublishing.com.